Site Specifications Guide. Simply click the button below. If you have more than 6 people and 2 seperate camping units (a Trailer and a Tent for example) you will require a second site. We do allow you to share a tent on the site as long as the total amount of people on the site does not exceed 6. The tenting fee is $4.00 for children under 18 sharing a site with their parents/carers or $20.00/night for an additional tent for Adults. Please note this is only applicable when there are 6 people or less per site, any additional people will require a second site (excluding children under 18, we will always keep them together on the same site as their guardians). Rates include FREE Hot Showers, FREE swimming pool, FREE wifi hot-spot access and much more! We do not charge additional fees for pets or additional passenger vehicles! Monthly rates available during April, May, June, September, October - please contact the office for rates. Non Service RV & Tent sites are available on a first come / first serve basis. ​Walk-In Tent Sites: a short walk (40 - 60 meters) to a soft bedded tenting pad. Group tenting available! You may make reservations up to 53 weeks in advance (1 year + 1 week) in advance of your anticipated arrival date. For example, you may make a reservation for your stay of July 1st-14th 2019 as early as June 24th, 2018. Please keep in mind that some folks might like to book the same site as you from June 25th - July 7th, 2019, as a result they were able to reserve that spot from June 18th 2018. If your favorite site was unavailable please ask to add your name to our upgrade list and we will contact you if your preferred site opens up! 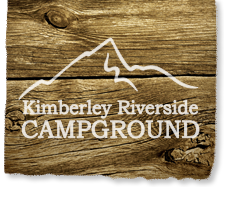 We absolutely love your campground & facilities. We are return users and have now began coming with our little girl and will definitely be back next year & the years to come!